The Pardon Power: Unidimensional, Shrinking ... Irrelevant? The Founding Fathers had a fairly negative view of human nature, and incorporated that view into the Constitution of the United States. In order to avoid to abuses of monarchy, they separated powers and - in order to preserve that separation - installed a system of checks and balances. This institutional framework was based on the assumption that it was dangerous to put unchecked power anywhere, and much more so if placed in one set of hands. Legislatures are not perfect. The laws they pass can be vague, overly broad, and can have unintended consequences. Sometimes, the intentions behind laws are lost in interpretation / application by courts. And yes, every now and then, legislatures and courts can be flat-out wrong. Alexander Hamilton, in the Federalist papers, worried about these possibilities, along with the fact that the criminal codes of every nation have, historically, had a natural tendency toward over-severity, harshness. The obvious solution was to make the executive a meaningful participant in law-making and judicial processes. And the obvious mechanism to assist in this participation was the pardon power - and history convinced Hamilton that there should "easy access" to pardons. 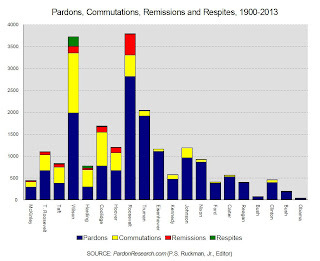 The chart below provides some insight as to how the pardon power has, over time, become unidimensional and less frequent. 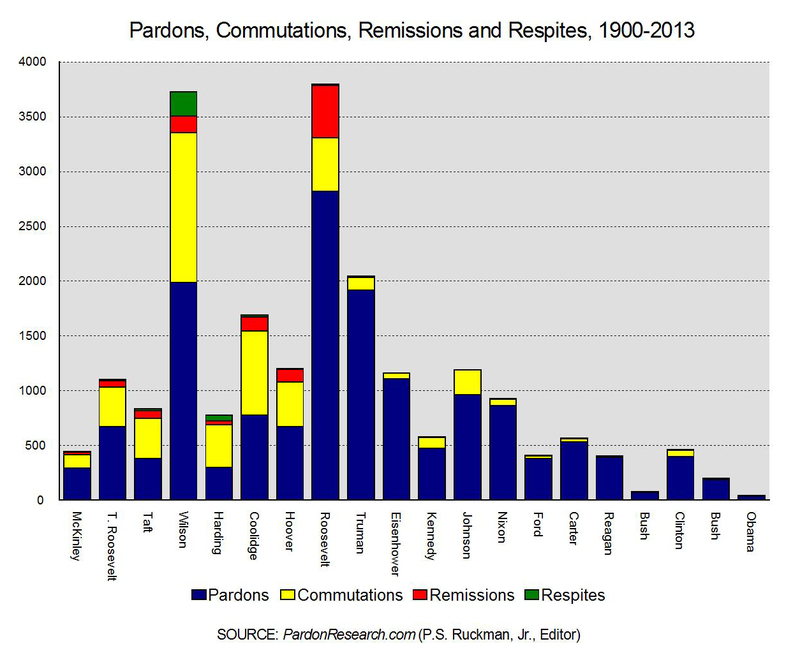 On the left side of the chart, one can see energetic use of the pardon power in a variety of ways: pardons, commutations of sentence, remissions of fines and forfeitures. As one moves to the right, one see this diverse utilization of the power vanish almost entirely to the occurrence of pardons to restore civil rights. The other obvious trend, moving left to right, is that the total number of individual acts of clemency is decreasing considerably, almost to the point of non-existence. President Obama's first term was the least merciful since the first term of George Washington. These data render the conventional wisdom re pardons patently silly. Presidents (and governors) appear to fear the public perception that acts of clemency over-turn the decision making of judges and juries, spring hardened criminal from prison, and toss them into the streets to resume a life of violent crime. The perception is fueled by skews in media reporting and lends itself handily to the notion that 'controversy' and loss of political capital are likely to follow any act of mercy. In fact, President Obama has pardoned 39 people and there is a better than average chance the reader cannot not name a single one of them. 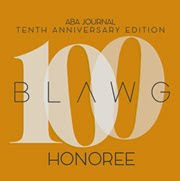 Most committed offenses decades ago and their offenses were so minor they were not even sentenced to prison. The President's pardon simply restored their civil rights. There is not a violent criminal among them, and no political capital was lost by anyone. President Bush granted pardon to 189 people. Can you even name 3 of them? (Scooter Libby was not pardoned, incidentally. His sentence was commuted). Reagan granted almost 400 pardons. This is the REAL face of federal executive clemency, the face that does not make the headlines, the face that - thanks to the media - consistently eludes the American public.